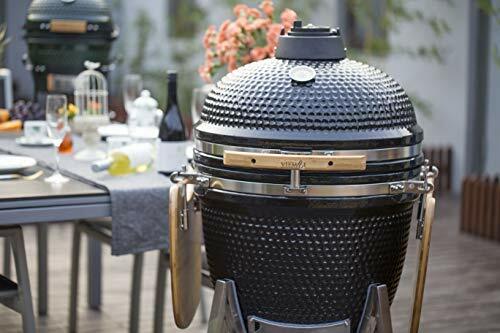 Egg style grills, which are also sometimes referred to as Kamado grills, have grown in popularity in recent years. They are well known for their efficiency, as well as their good looks. 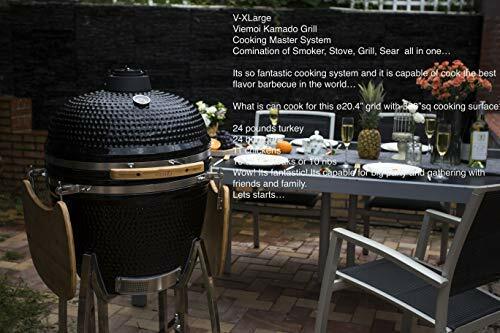 The Viemoi Kamado V-XLarge steps up to the plate with this grill. It has exceptionally thick walls which help maximize heat retention. Fresh air passes through the stainless steel bottom damper and passes over the charcoal to make sure it is fed with the oxygen it needs to maintain a consistent fire. The heat and smoke then rises to escape through the top vent. The heat retention of the walls and the smoke circulation effect of the lid means that the fire burns consistently. 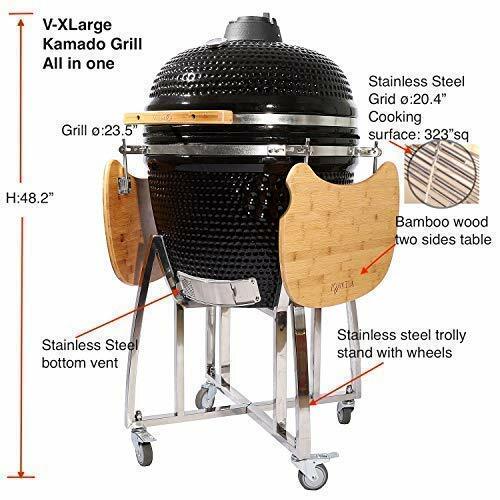 With some careful adjustments, you can use the Viemoi Kamado to grill, smoke, or even bake. When it is dialed in for high heat, it has the ability to create a steakhouse level sear. Dialed down to a more modest fire, you can efficiently grill something that needs a longer cook time like chicken leg quarters of a spatchcocked chicken. It’s efficiency also lets you grill chicken wings with a perfect smoky balance and a minimal amount of flare-ups. The Viemoi Kamado can also be used as a smoker. You just have to dial the airflow down to its lowest setting. The thick interior walls will retain the necessary heat to slowly cook the meat and breakdown collagen into succulent gelatin, while the smoke gently wafts over top. The Viemoi Kamado also has bamboo side tables that fold down for convenient storage. The trolley stand holds it securely and the built-in casters allow you to wheel it across level surfaces. However, they are a little small for wheeling it across a rough surface like a cobblestone patio or a grassy lawn. The Viemoi Kamado has a somewhat higher price point than some of its competitors. This seems to be related to the high-quality materials used in its construction. 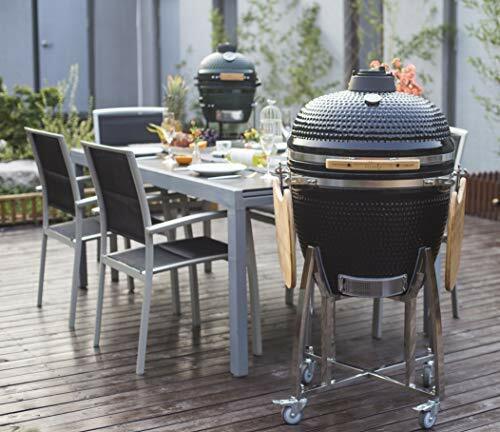 The exceptionally thick walls of the grill maximize heat retention, and the copious amounts of stainless steel, as well as the sleek ceramic appearance also help it stand out on your deck or patio. The folding bamboo side tables are nice. Bamboo is a great material for an outdoor grill because it has the hardness to allow you to cut grill side, while also being just as weather resistant as redwood, which doesn’t have the same hardness. It’s also pretty simple to put together because it doesn’t have a lot of parts. Still, you will want to take your time assembling and attaching the trolley stand. It can be a little meticulous. With some patience and basic tools, you should be able to assemble the grill in a little over an hour. If you prefer, some online retailers offer professional assembly for a relatively friendly price. 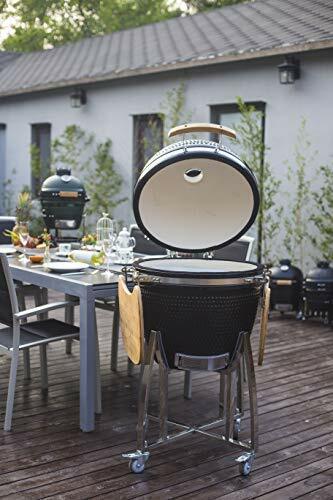 The Viemoi Kamado was designed to be versatile enough to handle high and low heat grilling, as well as being able to smoke like a traditional barbecue pit. When it’s dialed in just right, you can even use it to bake. The key is to make sure that you allow the fire to burn in the bottom for 10 to 15 minutes. This will allow the thick side walls to soak up the heat, and radiate it back. It can take a little while to get a feel for just how much air to let in for the lower temp applications. So, be patient your first few times. It might be easier to choose cheaper cuts of meat like rib tips or bone-in chicken thighs to get a feel for it. Then you can graduate up to pork shoulders and the temptation of baking a grilled pizza! When it comes to high heat grilling, you will get an even more intense fire if you use lump charcoal. On the other end of the spectrum, you should try to use wood chunks instead of wood chips paired with an equal amount of high-quality charcoal briquettes. 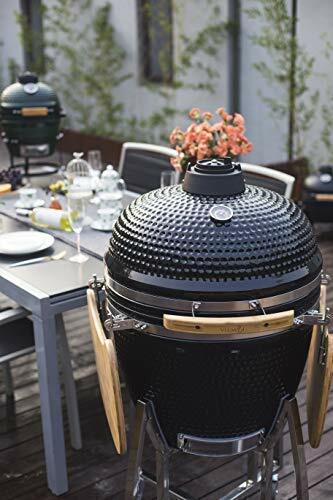 When the stainless steel bottom damper is set to its lowest setting, the Viemoi Kamado is very efficient, and the wood chunks will ensure that the smokiness lasts longer than if you used wood chips. If all you can find is wood chips, try to soak them in water overnight, so they will smolder, rather than flare. 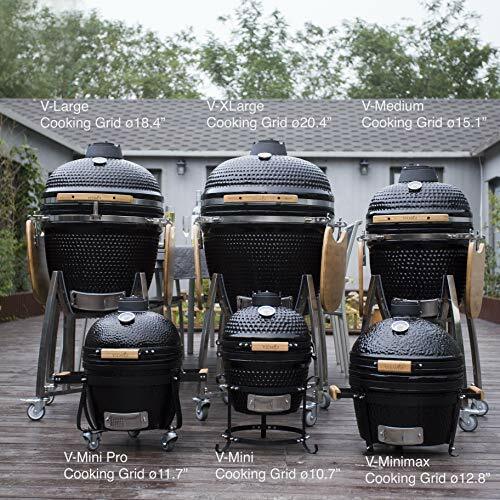 The Viemoi Kamado is larger than some of its competitors, and other grill/smokers in it’s own product line. Yet it still feels a little small. 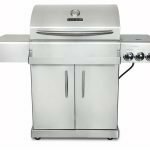 The stainless steel grill grates have a 20.4-inch diameter, which means you only have 323 square inches of grill space to work with. With some creative placement, you could grill supper for a family of four, but this isn’t a large capacity grill. 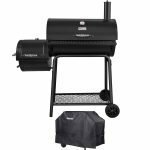 When you use it as a smoker, it can handle a whole chicken or even a pork shoulder, but it isn’t big enough to handle a full-size brisket. The Viemoi Kamado is easier to clean than a standard charcoal grill. The one complaint would be the that the stainless steel grill grates do tend to make food stick, which means they need a little extra scraping down. You might be able to reduce this, by gently rubbing them with an oil-soaked paper towel right before you place the food down on the grate. The Viemoi Kamando grill combines versatility and efficiency with high-quality materials. This gives it the ability to truly serve as a high heat grill, low heat smoker, and in a pinch, it can even produce a delicious grilled pizza. The price point is a little high compared to most of its competitors. 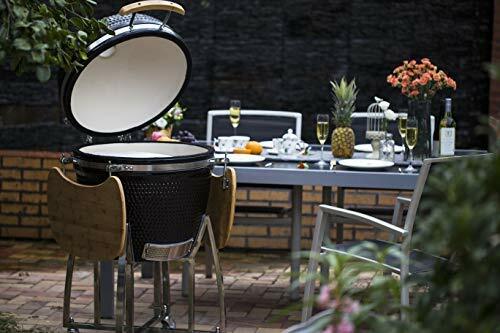 At the same time, it doesn’t give you the same kind of grilling space you would find with a simple 26-inch kettle grill. Ceramic base with great heat retention. charcoal grilling ,High tightness, fuel saving. Wide Temperature range: high searing temp down to slow smoking(50°F-800°F). extra-large capacity. 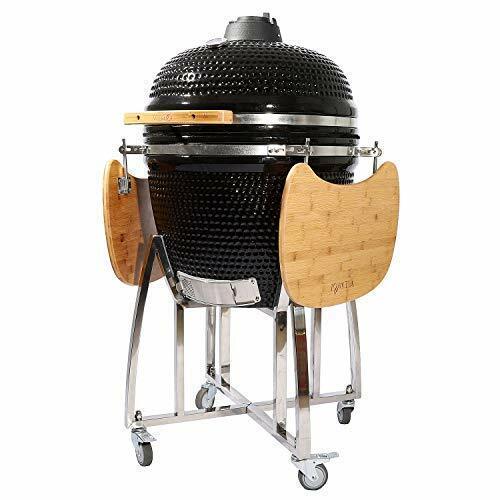 extreme Versatility ,Griller for searing, Smoker for indirect heat,Oven for Bake pizza or roast for all thicker pieces of meat, whole chicken etc. Maintain Moisture: foods grilled more juicy than gas grill's.